The Museuciencies website https://www.museuciencies.cat is managed by the Museu de Ciències Naturals de Barcelona Consortium, with registered address at Plaza Leonardo da Vinci, 4-5, 08019 Barcelona (Spain), fiscal identification number (NIF) Q0801897J, and contact e-mail address museuciencies@bcn.cat. By accessing and browsing the content of this website, the user accepts these terms and conditions of use without reservation. Unless prohibited by applicable law, the Museum reserves the right to alter and update the information contained on this website, at any time and without prior notice, and to change its configuration, presentation and terms and conditions of use. Users are automatically bound by these terms and conditions of use from the time they access the website and must be aware of any changes made to these terms and conditions. Users accept their responsibility with regard to how they use the website and the content and services it provides. Users shall also be liable before the Museum and/or other partners for any damages caused to the Museum and/or other partners if these terms and conditions of use are not adhered to. The information provided by the website comes from the diverse departments of the Museu de Ciències Naturals de Barcelona. The Museum shall not be liable to the user for any damages caused by the use of this website or by any action deriving from the information provided. The Museum shall not be liable for any safety failure or disconnection that may occur nor for any damages that the user’s device (software and hardware) or any folder or stored document may suffer due to the existence of a virus or viruses on the user’s device. Furthermore, the Museum shall not be liable for the incorrect functioning of the web browser or the use of a version of the browser that is not up to date. The Museum does not review the websites that link to Museuciencies; these websites are maintained by third parties beyond the control of the Museum and the Museum does not recommend or approve their content. The Museum expressly rejects any liability for any damages suffered by users deriving from the information found on these websites. Unless otherwise indicated, the content of the Museuciencies website is published under a Creative Commons Attribution 4.0 International license (CC BY 4.0). Cite the source clearly and appropriately and indicate whether any changes have been made to the data. Redistribute the data with an equivalent license to that mentioned herein, without additional restrictions. The data protection policy of the Consorci del Museu de Ciències Naturals de Barcelona is described below. The policy refers to data processed in compliance with the General Data Protection Regulation (EU) 2016/679 of the European Parliament and of the Council of 27 April 2016 (hereinafter, the GDPR). The entity responsible for the processing of your personal data is the Consorci del Museu de Ciències Naturals of Barcelona (hereinafter, the Museum), CIF Q0801897J, with a registered address at Plaça Leonardo da Vinci, 4-5, Barcelona 08019 (Spain). Telephone: 0034 932 566 002. Email: museuciencies@bcn.cat. Website: https://museuciencies.cat. The Data Protection Officer (DPO) oversees compliance with the Museum’s data protection policy, ensures that your personal data are legitimately processed and that your rights are protected. The DPO’s functions include responding to any questions, suggestions, complaints or claims made by the persons whose date are processed by the Museum. The DPO can be contacted by writing to Plaça Leonardo da Vinci, 4-5, Barcelona 08019, by telephoning 0034 932 566 002, or by sending an email to the electronic address dpd_CMCNB@bcn.cat. Contact: To deal with inquiries made through our website contact forms or by telephone. Museum services: To register people who book or purchase tickets to visit the Museum or who attend events or activities organized by the Museum. The registration process requires us to ask for essential information such as identification details and, when required for payment purposes, banking information. Information about our services: When expressly authorized to do so, we use people’s contact details to communicate information about activities and events organized by the Museum. Management of provider data: We register and process the data of providers of goods and services, including the data of freelancers and representatives of legal persons or entities. We only collect the data necessary to maintain the commercial relationship and only use it for this purpose and as appropriate for this kind of relationship. Video surveillance: Visitors to the Museum’s premises are informed by means of approved signs of the existence of video surveillance cameras. The cameras only record in locations where it is necessary ensure the safety of people and property and the images are used only for this same purpose. What are the lawful bases for data processing? To comply with a contractual relationship. This is the case of relationships with our providers and with people who purchase tickets or hire other services from the Museum. To comply with legal obligations. An example is communication of data to the tax authorities, as established in fiscal and regulatory rules governing commercial relationships. On the basis of consent. We send news about services and schedules of activities and events to people who agree to receive this information. To perform a task in the public interest. We use video surveillance to safeguard the collections for which we are responsible. As a general rule, we only communicate data to public administrations or authorities and only to comply with legal obligations. Data referring to invoices to customers may be communicated to banking entities. Whenever necessary and justifiable, we communicate data to police and security forces and to competent judicial bodies. Data are not transferred outside the European Union (international transfers). The length of time we keep your personal data is determined by different factors, but the first and main reason is the need to fulfil the purpose for which they were collected. The data are also kept for as long as necessary to deal with possible claims and the requirements of other public authorities and judicial bodies. Consequently, the data will be kept for the time necessary to preserve their legal or informative nature or to demonstrate compliance with legal obligations, but for no longer than necessary in accordance with the purposes of collecting the data. In certain cases, such as accounting documentation and invoices, tax regulations require us to keep the corresponding data until responsibilities have prescribed. The data that are processed exclusively on the basis of consent are retained until the consent is withdrawn. Images recorded by video surveillance cameras are kept for a maximum of one month, except in the case of incidents that involve the police, security forces or judicial bodies. The criteria we apply to the conservation or erasure of data are determined by regulations governing the conservation of public documentation and decisions of the Spanish National Commission on Access, Evaluation and Documentary Selection (Comisión Nacional de Acceso, Evaluación y Selección Documental). What are your rights regarding the personal data we process? To know that your data is being processed: You have the right to know that we are processing your data, regardless of whether or not a prior relationship exists. To be properly informed when your data is collected: When we collect your personal data, you have the right to receive clear information on the purposes for which they will be used, who will be responsible for processing and any other relevant information. To access: You have the right to know exactly which personal data are being processed and for what purpose and also which data (if any) are communicated to others. You also have the right to obtain a copy of your data and to information on how long they will be kept. To rectification: You have the right to rectify inaccurate personal data held by the Museum. To erasure: In certain circumstances you have the right to request the erasure of your data when, among other reasons, they are no longer necessary for the purposes for which they were collected and processed. To restrict processing: In certain circumstances you have the right to request that the processing of your personal data be restricted, in which case they will only be kept in order to exercise or defend possible claims. To data portability: In cases provided for in the GDPR you have the right to obtain your personal data in a commonly used, structured, machine-readable format. To object: You have the right to adduce reasons related to your particular circumstances that will stop the processing of your personal data to the extent that this may cause harm. If you do not receive a satisfactory response in the exercise or defence of your rights, you may file a claim with the Catalan Data Protection Authority (Autoridad Catalana de Protección de Datos) using the forms or other channels accessible from its website at www.apd.cat. To submit claims, request clarifications or make suggestions, you may also contact the DPO by sending an email to dpd_CMCNB@bcn.cat. A cookie is a file containing a small amount of data, which is downloaded an installed on a device during browsing on a website. In subsequent visits to this website, the cookies are recognized by the original website or by websites that are linked to it. Cookies are useful because they make it possible to store and recover information on the number of visitors and the devices and browsing habits of the users; depending on the information contained in the cookies and on how the device is used, cookies may also make it possible to recognize users. For more information on cookies, visit www.allaboutcookies.org. Session cookies: these only exist during the session that the user opens on visiting the website. They disappear from the user’s device when the user closes the browser or turns off the device. If the user has chosen to identify themselves using other mechanisms provided for this purpose, session cookies are used that contain encrypted information to differentiate them from other users. Persistent cookies: these cookies are stored on the user’s device after the browser has been closed or the device turned off. They are activated each time the user visits the website that created the cookie in question. When the website is visited, a unique identifier is assigned to the user, which is associated with a persistent cookie that is downloaded to their browser. Proprietary cookies: the information obtained by means of these cookies is administered by Bioexplora to provide the service requested by the user. Third-party cookies: the information obtained by means of these cookies belongs to Google, Inc., Teitter, Instagram, Facebook. 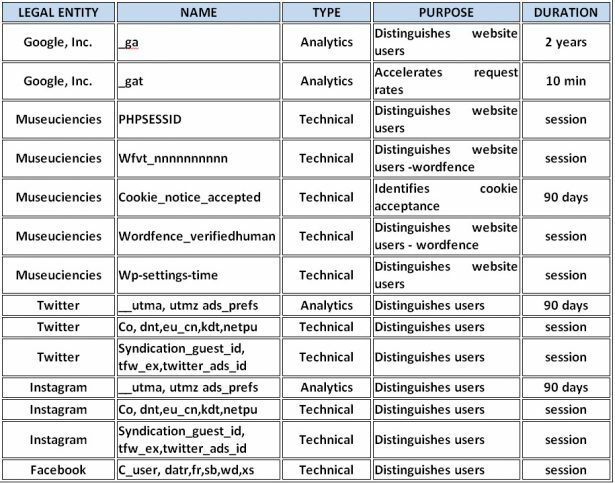 Technical cookies: these allow the user to browse and use the different options and services provided on the website, such as traffic control and data communication, session identification, information requests, viewing videos, use of security elements during browsing or when downloading, publishing or sharing content. Analytics cookies: these record the number of visitors, measure and statistically analyze the activity of users and create browsing profiles that make it possible to make improvements to the website. [Name of web page], Museuciencies, Museu de Ciències Naturals de Barcelona Consortium, https://www.museuciencies.cat [date of query].